Mastering the art of hospitality, Hartford Marriott Farmington invites you to experience our thoughtful amenities and intuitive services. 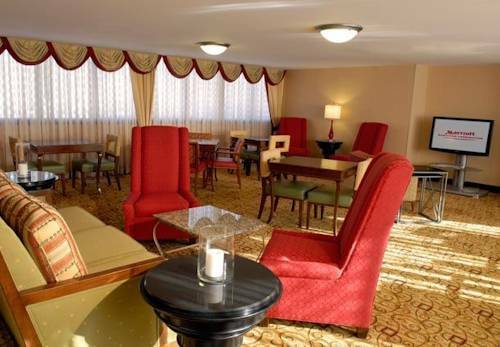 Our hotel is situated right off Interstate 84, making it easy to visit premier destinations including Central Connecticut State University, Newington and West Hartford. If you're traveling for business, you'll value our prime location near United Technologies Corporation and ESPN Headquarters. Following an eventful day, retreat to relaxation in our spacious accommodations featuring high-speed Wi-Fi, featherbed mattresses and room service. Every morning, stop by Village Green and our Starbucks coffee bar to fuel up for the day ahead. Savor an authentic Japanese lunch or dinner from Sushi Bar or classic cocktails at Proprietors Lounge. If you're hosting a celebration or meeting, set the stage for success in one of our 24 flexible event spaces while utilizing our skilled planners and catering services. A brilliant travel experience awaits at Hartford Marriott Farmington. Village Green: Begin your day by stopping by Village Green, our restaurant serving classic continental breakfast choices within a warm and inviting atmosphere. Proprietors Lounge: Following a busy day of work or sightseeing, unwind with a tasteful combination of classic cocktails and appetizers in our spacious lounge boasting a casual ambiance and comfortable furnishings. Sushi Bar: Take a break from your travels in Farmington, Connecticut and treat yourself to an authentic taste of Japan. Choose from our wide range of delectable sushi rolls made with the freshest ingredients available. Starbucks : Whether you need a treat to start your morning or an afternoon pick-me-up, our Starbucks coffee bar serves roasts ranging from light to dark, as well as a selection of natural teas to help energize your day.